Lakeside PTA in collaboration with the Lakeside Counseling Department is excited to present Dr. Casey Cooper to speak to students during their school day and for a parent event in the evening. Dr. Casey Cooper is a Licensed Psychologist. She received her Masters in Marriage Family and Child Counseling and Ph.D. in Counseling Psychology from the University of SouthernCalifornia. She has helped thousands of students, parents, teachers, and coaches through her presentations, private practice, community outreach, and podcast. Please join us Monday, March 25th from 6-7PM in the Lakeside Performing Arts Building for an interactive parent presentation geared towards helping your child exhibit strength, motivation, and excellence. Important Message from IPSF about the City of Irvine Proposed Budget Cuts to K-12. The City of Irvine is currently undergoing a transition to a two-year budget, and as part of this process, City leadership has proposed cuts of up to $2 million to K-12 education support. Irvine has always been able to do more with less, thanks to incredible community support and creative approaches to making educational excellence a priority. Any cuts to City support of education would further widen the per-pupil funding gap in Irvine, and negatively impact the educational experience of more than 35,000 students in IUSD. The Challenge Match Grant is one of the areas that are under consideration for cuts in the City budget. As you know, the City matches all donations to IPSF, up to $1.3 million annually, to help inspire the parent and corporate community to give generously in support of education. 100% of Challenge Match Grant funds are passed through directly to the district – IPSF does not take any overhead or fees from these funds. The benefit of the match is two-fold: IUSD receives the donation of $1.3 million, but it also allows IPSF to leverage the match into additional fundraising, which translates into more funds for the district. Each year, IPSF donates over $2 million in cash to IUSD to help fund critical areas including Teachers, Instructional Assistants, Music Specialists, Nurses, Athletic Trainers, Mental Health Counselors and more. Cuts to this program would not only affect the $1.3 million contributions from the City, but they would also negatively impact IPSF’s ability to fundraise for additional district support. The other elements of the City’s funding for education through the Educational Partnership Fund are equally important to IUSD students, including additional support for School Resource Officers, Crossing Guards, School Nurses and Counselors, and more. City support funds PEOPLE – people who provide crucial services that impact each child in every IUSD school. Please help spread the word that we need to send a message to the City leadership that educational excellence matters in the City of Irvine. You can help by attending the upcoming City of Irvine Budget Meetings this month to voice your concern about proposed cuts to key education and school safety programs or contact City Council Members directly. · March 20 at Portola Springs Community Center from 6-7 p.m.
• Demand that before making funding cuts to IUSD students and disregarding the will of Irvine voters and the City Council, the new City Leadership should survey Irvine residents and/or put another measure on the ballot. • Inform the City Leadership that 70 percent of Irvine voters overwhelming passed Measures R and BB in back-to-back elections because they know quality schools increase property values, drive home sales, and support a safe and prosperous community. • Remind the City Leadership that Irvine is often cited as one of the best places to live, with education as a top factor in the rankings, demonstrating the clear nexus between Irvine’s prosperity and IUSD schools. • Tell the City Leadership that it is wrong to balance the budget on the backs of Irvine students and to force Irvine residents to choose between student safety and instruction. • Many families have moved to Irvine and pay premium prices to live here so they can send their children to IUSD schools. Hardworking families with school-age children and Irvine residents will not accept any proposals that decrease instruction and safety while widening the IUSD funding gap. • The City’s masterplan, specifically places schools at the heart of each neighborhood, because the current City Council and previous councils have prioritized education and know the value it brings to Irvine, which is unlike any other city. Tell the new City Leadership, in Irvine, we support student safety and instruction and that sacrificing one for the other is unacceptable. Join us on Wednesday, March 20th at The Stand! Support Lakeside! All the kids get a chance to enjoy a yummy slice of pie and some bounce houses!! Thank you to the Math Department and the Youth Action Team from the City of Irvine. Woodbridge High School PTSA is presenting a talk about the dangers of vaping on March 20th 7 pm at the Woodbridge Staff Lounge. All parents, neighbors and friends are invited to attend. Please see attached flyer. The Lakeside Math department is looking for parent volunteers to help serve pie! As always, thanks for your continued support of Lakeside Middle School. Thank you to all of our PE volunteers! Ms. Wong and Mr. Rohrs appreciate your time and so does PTA! Today I was on campus for zero and first period and captured these lovely parents volunteering. Thank you! Woodbridge High School Comedy Night. Woodbridge night at the Improv is March 27. This is our main fundraiser for Grad night. Please join us for a fun night of comedy and good food. Last year was a blast and we encourage everyone to come out for a great night of humor. Tickets available online and there are VIP table and booth options. Ages 18 and older. Please join us and support our final send-off for our seniors. Our February Restaurant Night is at MOD Pizza, Wednesday, February 13th! Please stop by anytime during the day and support Lakeside Middle School. MOD will donate 20% of all proceeds to Lakeside! Make sure to mention you are supporting Lakeside Middle School prior to paying for your meal. Does your child have basketball fever??? If so, we are searching for some basketball players for our Lakeside Basketball team for the Hoops Classic. If you are interested in coaching please email Erin Stottlemyer at srorrle2775@hotmail.com. The schools with the most points at the end of the year will be awarded the coveted Champions Cup to display at their school. Points were earned during Harvest Cup, Winter Bowl, and Hoops Classic. Lakeside has a successful Harvest Cup and Winter Bowl so join us for the basketball tournament. Lakeside_IUSD is at Orange County Great Park. Hoops Classic Try out Registration has opened and will be opened until Feb 8th. The tournament will be March 8-10. Don’t forget to sign up for the last tournament in the series, Hoops Classic, by February 8. The tournament will be March 8-10. If you are interested in coaching please email Erin Stottlemyer at srorrle2775@hotmail.com. The schools with the most points at the end of the year will be awarded the coveted Champions Cup to display at their school. Points were earned during Harvest Cup, Winter Bowl and Hoops Classic. Please register at the link below. Congrats to our winter bowl teams that played hard yesterday. Dine out tonight at Chipotle! Lakeside PTA will be at Chipotle tonight for our monthly meeting. Come say hello and join us to hear what new things are happening at Lakeside. Grab some delicious food tonight at Chipotle and support Lakeside at the same time! Happy New Year Lakeside. Wishing everyone a prosperous and healthy new year. Dining at Home with Square One Pizza tonight. Liz, the owner, greeted me warmly and the server had my order ready to go! Such a fabulous family business and I love how they support all of our local schools. Don’t forget to get your pizza tonight and support Lakeside! Thank you to Samantha for once again creating a fabulous breakfast for our awesome teachers and staff! Thank you also to all of our parent volunteers who baked and donated such yummy food. We are truly blessed to have such a supportive Mariner community! Lakeside’s 2018 Teacher of the Year! Restaurant Night Wednesday, Dec 12 at Square One Pizza. Join us for some delicious pizza and pasta! Show the flyer and Lakeside will receive 20%. Support Lakeside and this great mom and pop restaurant! It is with great sadness that I share with you that Lakeside 8th grader Ruya Duman passed away this last Saturday due to complications related to leukemia. This is a tragic loss and our hearts are with Ruya’s family and friends during this difficult time. The family has planned services for Ruya on Saturday, December 8 at 3 p.m. at the Islamic Center of Irvine, located at 2 Truman Street. To support students who may need to process this loss, we have had additional counseling support on campus this week. If you feel your child needs support now or in the coming weeks, please do not hesitate to contact our counselors or my office by calling our main office line 949-936-6100. If needed, the following resources may be helpful when talking to your student about grief. If you would like to send a card, please send it to school and we will forward it to Ruya’s family. Oh, the weather outside is frightful! But I have a new Hoodie, so I’m feeling warm and delightful! Winter is here! Keep your kids warm all day with a new Lakeside hoodie! Lakeside spirit wear is on sale now! Order forms have been sent home or you can print one out here! Due date is Dec 6 so we can get those hoodies to you before winter break. Order one for your child and one for you too! The Second Annual Lakeside Turkey Trot was a success today in large part because of our generous parents and teachers. Teachers and kids alike had a fast run, breaking several Lakeside time records! Thank you to all of our parent volunteers who cycled and monitored the course, stuck stickers to huge time sheets, and distributed water and treats at the end of the run. Thank you also to all the donated cases of water, it was much needed at the end of the run. We are thankful for all of our parent and teachers and are blessed to have such strong support from our Lakeside family. PTA wishes you a very Happy Thanksgiving. Our second annual Turkey Trot is tomorrow Nov 20th. Thank you to all the parents who have volunteered for tomorrow’s event. Please go to the front office and check in at 8 am or earlier and then meet us behind the Field House to set up and monitor the course. The weather should be good for running! See you tomorrow! Gobble Gobble Run!! Every year Woodbridge High School hosts Lakeside and Southlake MS bands to join them in the stands sharing the rally band experience!! Listen to them play! Way to go Mariners and future WHS Warriors!! Volunteer cyclists and cases of waters are still needed! Our second annual Turkey Trot is just around the corner on Nov 20th. It is a huge event and we will need lots of parent volunteers to help make it a success. We also need parents to donate water for the kids after the run. Please click on the link below to sign up and volunteer for the event and to donate a case of water. The second Dine Out Night of the year will take place at MOOYAH on Wednesday, November 14th! Please stop by for dinner and support Lakeside Middle School. MOOYAH Restaurant will donate a portion of all proceeds to Lakeside! Please bring the attached flyer or have it available on your phone. You must mention the fundraiser and present the flyer prior to paying for your meal. Check out all of our Mariners participate in Walk to school Wednesday during RRW last week! Thank you to our Red Ribbon Week Committee, Rani and Stephanie! CONGRATULATIONS TO JETT WHO WON OUR PTA RAFFLE!! Congratulations and Good Luck to our Lakeside Girls team. They won their game 2-1 and will advance to the next round. The game will be on Sunday 10/21/2018, 8 am., at the Great Park! A shout out to the boys’ team, who fought an extremely hard game but lost 2-1 in the last minute. Although heartbreaking, we congratulate them for their perseverance and resilience. Thank you again to our parent coaches, Matty West, and Richard Sabeh!! And a HUGE shout out to our parent coach volunteers Matty West, who is coaching our Lakeside Girls Team and Richard Sabeh, who is coaching our Lakeside Boys team. Thank you so much for volunteering!! Red Ribbon Week supports the National Family Partnership in their nationwide campaign to develop well-being in young people through drug prevention, education and advocacy. Our second annual Turkey Trot is just around the corner on Nov 20th. It is a huge event and we will need lots of parent volunteers to help make it a success. We also need parents to donate water for the kids after the run. Please click on the link below to sign up and volunteer for the event and to donate a case of water. Thank you for your support! Reflections Art Contest Due Oct 15. A reminder that your Reflections Art Projects are Due Oct 15. Lakeside will hold Harvest Cup tryouts for the Boys and Girls team on Friday, October 5th, after school on the field. All are welcome to try out to represent Lakeside! The Irvine Prevention Coalition and Irvine Unified Council PTA Presidents Present: A Free Seminar about Social and Emotional Health on IUSD Campuses. How and To Whom Can Students Reach Out? IUSD District Office, 5050 Barranca Parkway. Interested in joining the Lakeside MS team? Registration is open for a few more days for the 2018 Harvest Cup team! We are also looking for a coach (parent or teacher). If you are interested in joining or have some questions please contact Erin Stottlemyer at stottle2775@hotmail.com. For more information about Harvest Cup click on the link from OC youth sports. Just a reminder that THIS FRIDAY, Sept.28th is the last chance to order Lakeside Spirit Wear and PTA Memberships! Don’t miss out on your chance to get a t-shirt or sweatshirt in our brand new logo! Both can be returned with payment to your student’s advisor by this Friday. Spirit Wear will be delivered in mid-October. The raffle drawing will be in mid-October. Our first restaurant night of the year is September 26th at MOD Pizza. It is an all-day event! Bring this flyer or show it a digital copy of it on your phone and MOD Pizza will donate 20% back to Lakeside. Join your friends for lunch and then bring your family after school for dinner and support MOD Pizza and Lakeside. It’s that time of year again, the PTA Reflections Art Program is underway for the 2018-2019 school year. Each year, students are recognized for bringing the program theme to life through their art. Guidelines and entry forms for each art category are available on the IUSD and PTA website. Please adhere to all requirements. The deadline for submission at Lakeside is Monday, October 15, 2018. Please submit all entries to the front office after school. In California, winning entries from our school will be advanced to the Council for judging, and after multiple divisions of judging top entries from our state PTA advance to the National PTA for a final round of judging. Join PTA and enter to win an autographed hockey stick from Ducks player Korbinian Holzer! There is still time to join Lakeside PTA and be entered in the raffle drawing for your chance to win a Ducks hat and autographed hockey stick from Ducks player Korbinian Holzer! Earn one raffle entry per paid membership. Go to the Lakeside PTA website at www.lakesidepta.org/membership to sign up. The deadline for the raffle is September 28, 2018. Please plan to arrive at school a few minutes early to check-in at the office and obtain a volunteer sticker and then report to the field house for instructions from the P.E. teachers. Again, thanks for your help and support of Lakeside! Turn your old clothes into money for Lakeside! Now through this Friday until 12 noon, we are collecting your old textiles for Clothes for the Cause. Every pound collected means money for our school. Clothes, shoes, textiles and more will be RESOLD, RECYCLED and REPURPOSED. The usable clothing will provide affordable clothing to those in need. Recycled fiber products save money and resources by using existing materials. 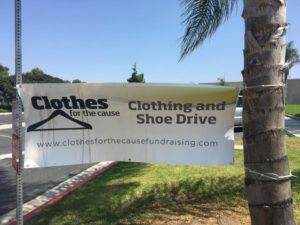 Clothes for the Cause closes the loop for old items and keeps it out of our landfills AND at the same time raises money for our cause, Lakeside, and our kids! The money raised from our clothing drive goes straight back to our kids this YEAR! Last year’s donations help pay for the new chilled and filtered water bottle fountains! This year our goal is to give the kids more shaded areas at the lunch tables. So help us help our kids get more shade! Drop off your bags of clothes at the Lakeside Middle School sign on Lemongrass in the morning. You can also bring your bags of clothing during Back to School Night on August 30! Thank you Principal Sodorff for the many bags of clothes for Lakeside. Let’s challenge each family to donate this much too! Every bag of clothing counts! Lots of bags for the first day of the drive. Jesus and the PTA collected bags all throught the day! Thank you! It’s here! 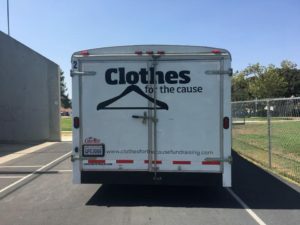 The trailer arrived for the Clothes for the Cause drive. We are ready to receive all of your old clothes, shoes and book bags. Bring them in starting tomorrow. Drop them off at the Lakeside sign on Lemongrass in the morning! Thank you for your support. PTA Membership Registration is NOW ONLINE! We have good news. Online PTA Registration is Now LIVE! Fill out the online form to pay for PTA membership and donations, sign up to volunteer, add your name to the directory and submit your payment through PayPal. You will receive an email receipt with the Tax ID included. It is that easy! Our clothing drive fundraiser with Clothes for the Cause will be August 27th- August 31st. As you clean out your closets over the summer, save those bags of clothes, old backpacks, shoes and textiles for Lakeside! During the first full week of school (8/27-8/30), you will be able to drop off your bags of clothes at the Lakeside Middle School sign on Lemongrass and we will take them to the trailer for you! It’s that easy!! Also, you can bring your bags to school during Back to School Night which will be on August 30th. Instead of discarding clothing, backpacks and household linens, give them a second life and turn all of the discarded material to cash for our school. Promotion Day at Lakeside! Congratulations Mariners! It was a beautiful morning for promotion ceremonies. Lots of kids, parents, and family attended and enjoyed a yummy selection of pastries, fruit and coffee before things got started. This year, PTA added the Class of 2018 balloon selfie wall and it was wonderful to see family and friends take lots of pictures. Good luck next year! Friday- As you know Ms. Cuneo is retiring and what a fitting way to end Teacher Appreciation Week than to celebrate and thank Ms. Cuneo for her 38 years of service. For this special day, PTA catered lunch from Panini Cafe and provided the banner for all to sign. Thank you to Ms Mack and ASB for assisting in getting the banner signed. Thank you to Mary O’Connor for help in scheduling. And special thanks to Samantha Rogers and friends who organized, decorated and catered throughout the week! Thursday was muffins in the morning. More delicious food for the teachers and staff. All the muffins were so good, they disappeared before we got a picture! So to recap the week’s events, a picture of the calendar for teacher’s week and a swag bag they all received. Wednesday – – Wake me up! Coffee, tea, and snacks served all day! Just what our teachers and staff need to make it through the week. Lakeside PTA to the rescue! Tuesday – PTA provided salad and sandwiches from Square One Pizza for Tuesday’s teachers and staff luncheon. And Champagne Bakery gifted each staff with a gift certificate for a fresh hot baguette. Desserts made by Samantha! So adorable! We are so lucky to have such talented volunteers at Lakeside who give so much of themselves for our teachers and kids. It’s Market Fresh Breakfast Monday at Lakeside. Thank you to all of you and your breakfast donations! Thank you for helping us thank our wonderful teachers! Special thanks to Samantha and Mia for organizing this event and all the teacher appreciation events this week! Next week is Teacher Appreciation Week. Monday, PTA will host breakfast for the teachers. Please sign up to bring a breakfast item. Thank you for supporting our Lakeside teachers. On tonight’s agenda is voting for PTA Board Members for 2018-2019. If you are a current PTA member, you are welcome to attend and vote. Thank you to NAMI, Officer Gramer and Lauren Stallings (Woodbridge HS Wellness Coordinator) for their thoughtful and insightful presentation Monday evening. We had a very nice turnout from the community. In the spirit of Thanksgiving, Lakeside PTA is wholeheartedly thankful to all of our parents for their continued support. On November 21st, we had our Turkey Trot, the rescheduled run day for our Red Ribbon Run, and once again our parent’s signed up to volunteer to do the chute, charts, distribute water, and monitor the path on their bikes! It was a fun experience to watch them race to the finish line, and it could not have been accomplished without our volunteers. Thank you, parents! And also many, many thanks for the water donations, coming to our restaurant nights and supporting all of the kids as they participate in Reflections and Red Ribbon Week. Your continued presence at our events is truly amazing and appreciated. Wishing you a fun, and food-filled weekend with friends and family. Happy Thanksgiving! Dine Out Night at CPK on Nov 8th! Get your pizza on and dine out ALL DAY LONG at the California Pizza Kitchen in Woodbridge on Wednesday, November 8th! 20% of all proceeds will go straight back to your Lakeside PTA, so get out of your kitchen and visit California Pizza Kitchen! Please be sure to bring in the attached flyer and present it to your server. Purchases include dine-in, take-out, catering and all beverages! **For more information about Lakeside PTA, please go to Lakesidepta.com or find and follow us on Facebook at Lakeside Middle School PTA (@lakesidemiddleschoolpta). 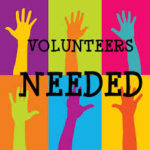 We are requesting your volunteer support for Lakeside’s upcoming fundraiser event. The Red Ribbon Run scheduled for today has been canceled due to excessive heat. The new date has yet to be determined but we will send out an announcement when it is decided. Thank you to all who have volunteered to help out today and please sign up if and when we have the new date. We will send out a reminder to volunteer when it has been determined. Penny Wars will be happening all week (7th vs 8th grade)- Bring your in your coins!!!! Dress up day theme: “Keep your hopes and your socks high!” Wear knee- high crazy socks! Activity: Lunchtime pledge cards and tie ribbon for your pledge to be drug-free! Dress up day theme: “The Future is Key, What Will YOU Be?” Dress like your future self. Activity: Come to the fashion show at lunch to win a prize. Red Raffle Tickets will be collected in a red bucket in the media center. Students MUST put their name on the tickets or keep the other half with the matching numbers! Red Ribbon Week is fast approaching and once again Lakeside will hold its annual “Red Ribbon Week” Lake Run. This is a fun run for students and staff and it is an event in which everyone participates! This year we find that we are in desperate need of WATER! We only have 2 cases of water in storage and we have 760 students, along with staff, participating in the Run. We are asking that you please consider donating a case of water to keep our runners hydrated. The 16 oz. bottles are great for this event and you can drop off your water donations by the Lakeside sign on Lemongrass or by the Lakeside sign on Stone Creek. Thank you so much for donating water and for volunteering for the Red Ribbon Lake Run! The Reflections Art Contest Deadline Submission date – Oct 17! It is not too late to create your art, music or written piece for Reflections. The deadline is Tuesday, Oct 17th to the front office. This year’s theme is “Within Reach.” To view the categories, rules for submission, and for the online application, please visit our forms and flyers tab or the State PTA website at http://capta.org/programs-events/reflections/. All submissions are due no later than October 17, 2017, by 3:05 p.m. in the main office. We look forward to seeing how far our students can reach! Dine-Out Night at Chipotle – TUESDAY, OCT. 17th! The second dine-out night of the year will take place at Chipotle Mexican Grill NEXT WEEK! Please stop by for dinner and support Lakeside Middle School. Chipotle will donate 50% of all proceeds to Lakeside! Please bring the attached flyer or have it available on your phone. You must mention the fundraiser and present the flyer prior to paying for your meal. The Reflections Art Contest Has Begun! Lakeside PTA is proud to once again sponsor the Reflections Art Contest for the 2017-2018 school year. This year’s theme is “Within Reach.” To view the categories, rules for submission, and for the online application, please visit our forms and flyers tab or the State PTA website at http://capta.org/programs-events/reflections/. All submissions are due no later than October 17, 2017 by 3:05 p.m. in the main office. We look forward to seeing how far our students can reach! Restaurant Night NEXT WEEK & Ralph’s Rewards! Lakeside Middle School PTA is hosting the FIRST Restaurant Night of the year at The Stand in Oak Creek. The Stand will donate 20% of all proceeds back to Lakeside! Please bring in the attached flyer with you and present it when you pay. PLEASE re-register your Ralph’s Rewards card for Lakeside Middle School! You must register your card every school year, so please go into your Ralph’s Rewards account to do this now. You can help earn money for Lakeside on all of your purchases at Ralph’s. Please follow the instructions on how to do this online. Thank you to all the Lakeside families and friends who donated bags and bags of clothing, shoes and textiles. In a short few days, we collected 5370 pounds of clothing! That is over 2.5 tons of clothes that will be reused or recycled. For all of your efforts, we will receive $537 that will go directly back to our kids this year. Our clothing drive was a success and we look forward to doing it again next fall. This year started off with a spectacular welcome back lunch for all of the teachers and staff. Samantha Rogers and Maia Starling, our two wonderful Hospitality PTA volunteers, created an amazing display as the backdrop to a yummy luncheon from Square One Pizza. This year, the PTA reached out to Coffee Bean Tea and Leaf during their give back to teacher’s campaign and they generously donated enough coffee and tea for each staff member! Thank you Coffee Bean!! And finally, PTA gifted to each teacher and staff member their choice of Spirit Wear! This year you will see our teachers and staff on campus with Lakeside pride. All this to start the year off and recognize the dedication that our Lakeside teachers and staff have for our kids. Thank you! Welcome back to school Mariners! We hope you are all enjoying the last few days of our lovely California summer weather. If you have not yet purchased the new Spirit Wear during registration day, you can still order until Sept 25th. You can also find the spirit wear form, the PTA registration form and other information on our forms and flyers tab. This year we will continue the tradition of having our clothing drive fundraiser with Clothes for the Cause. Instead of discarding clothing and household linens, give them a second life. Clothes, shoes, textiles, purses, belts and more will be RECYCLED and REPURPOSED. Clothes for the Cause closes the loop in the end life of clothes and materials at the same time they turn all of our discarded material to cash for our school. Our Clothes for the Cause drive will be September 5-8th. You will be able to drop off your bags of clothes at the Lakeside Middle School sign on Lemongrass and we will take them to the trailer for you! It’s that easy!! We look forward to another successful and fun year at Lakeside.